Heritage Health Care & Rehab has been in continuous operation since 1971. We are now beginning our third generation of the Jackson family operating the facility as caring, compassionate managers. You can be sure that your loved one, whether here for a short rehabilitation stay or for more long-term care, will have access to the latest treatment options and services and the best staff at one of the most respected rehab and assisted living facilities of its kind in West Alabama. Click here to learn more about our facility. Our rehabilitation programs are designed to produce the best functional results for our residents. This comes from our caring and skilled nursing staff, working alongside our respected and specialized therapists. Whether a patient is recovering from orthopedic injury or surgery (back operation, joint replacement), cardiac disorders or procedures (heart attack, cardiac surgery), stroke or other neurological disorders, respiratory disorders, or general medical conditions resulting in loss of strength and endurance, your loved one will be well cared for and on the road to recovery in a personal, pleasant, and supportive therapy atmosphere. In addition to having a long-term, assisted living facility on the same campus as our rehab structure, we also offer in-home rehab services, allowing us to provide a complete continuum of care. 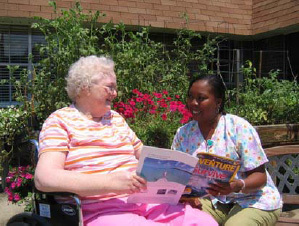 That personalized care provides the respect and dignity that every individual needs to live life to the fullest. Family and friends of our residents are always welcome. We have daily planned activities that include exercise, arts and crafts, bingo, spiritual services, and more. Please ask for an activities calendar when you take a tour of our facility. Phone 205-759-5179 for an appointment.